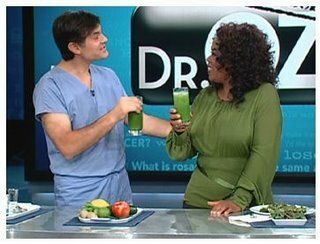 shares a green drink with Oprah on The Oprah Show. An EASY, TASTY way to eat your greens! I. WHAT ARE GREEN SMOOTHIES? II. WHY ARE GREEN SMOOTHIES FABULOUS? Green smoothies are basically leafy greens mixed with fruit smoothies, and the great part is that because you'll be mixing the greens with fruit, the fruit covers up the taste of the greens! (If you don't like fruit, please see the recipes for the veggie based smoothies and soups below). This is one of the quickest, easiest, tastiest, most nutritious ways out there to get in your daily leafy greens and fruits! ** For more information, search "green smoothies," or, click here: Most Popular Green Smoothie Questions Answered by Victoria Boutenko Victoria Boutenko is who came up with the ingenious idea of green smoothies! After consuming green smoothies on a daily basis for about 6 weeks, by making quick and easy "green smoothies," I noticed a huge difference in my skin. My skin doesn't break out like it used to, and it took on a healthier color as well. Fresh vegi juicing is brill. I take cucumber and ginger, I like the kick of a few ginger roots which help digestion and pures the blood. Nice post - good to hear some results with changing diet and acne. Hmm... I'll have to try that sometime. Nice suggestion! Danny - very cool info about Dr. Fuhrman, thanks! It really is sooo hard to eat big salads everyday, but the green smoothies make it so easy, because you just blend the greens and drink them! I learned that our jaws and teeth can't chew our food completely anymore because of our modern lifestyle. That's why drinking the greens is good. Juicing doesn't give you fiber so it's best to have the whole greens blended. Does any1 else use a slow rotation juicer here? Since I switched I notice my juice is miles better. These are really good. My mom used to make these for people we they got sick, except she added avocado which makes for a creamier shake. It's very beneficial even when you're not sick though. I thought heat was from cooked foods. I have a LOT of respect for Chinese Medicine, but I wouldn't let anyone tell me I couldn't have fruits and vegetables. They are our number one source for nutrition and antioxidants - our best bet against cancer! Maybe if you did some fats with your smoothies, like sunflower seeds, it would be better? If not, I'd try to find cooked foods that are high in Vitamin A. Check www.whfoods.com to see what foods are high in vitamin A. You could cook foods like spinach, kale, carrots, sweet pototoes, etc. Just don't start taking "synthetic" vitamin A, as it can be very harmful. You definitely want to stick to food sources. That was just what I needed because I've thought for awhile that I needed more nutrients to combat against acne. Awesome! I hope you start seeing improvement in your skin! Just give it a few weeks. :) When I first started the smoothies, I hoped clear skin would be a "miraculous side benefit" - I had no idea they were actually going to clear up my skin - I was thrilled! so by green veggies you mean lettuce? I thought lettuce had no nutrition in it, or at least I assumed that . When you make the smoothies do you just use lettuce or do you mix in other leafy vegetables too? Would just using something like iceberg lettuce be ok? This seems interesting, too bad I am too lazy to make smoothies. so by green veggies you mean lettuce? I thought lettuce had no nutrition in it, or at least I assumed that :doh: . When you make the smoothies do you just use lettuce or do you mix in other leafy vegetables too? Would just using something like iceberg lettuce be ok? Iceberg lettuce has virtually no nutrition - use romaine, spring mix, baby greens, spinach, etc. Yeah, the five - ten minutes it takes every day to make the smoothies can be a real problem for people. hehe :) It just depends on how badly you want clear skin. To me, 10 minutes every day is a small, small price to pay for having clear skin and preventing new scars. Yes, it is!!! Anything over 90 decibels can damage hearing. If your blender is noisy, just cover your ears, or, a very simple, easy solution is to go to Home Depot to the safety department that has things like ear protection muffs. For about $10-15, you can get ear protection. They look like giant headphones, haha. Before you blend, just stick them on - easy! I get laughed at for it, but hey, my ears will thank me down the road! My fist blenders/juice extractors were very noisy. However my slow roating juice is not loud, it tends to grind the crap out of the veg/fruit more than slice it into parts. Tho i paid crap loads for it compared to the Ã‚Â£100 I spent on my first bunch. When I was done making it, my brother laughed at me. From now on, I'm probably going to just do fruit smoothies. How long did it take before you saw any improvement? And before you were totaly (almost) clear? You gave advise in your first post about how to do when you travel. I think IÃ‚Â´ve heard of some pill with greens in it. DoesnÃ‚Â´t that sound familare to anyone else but me? You gave advise in your first post about how to do when you travel. I think IÂ´ve heard of some pill with greens in it. DoesnÂ´t that sound familare to anyone else but me? I don't remember exactly. I just know that in about 6 weeks, I realized I wasn't getting any new blemishes. When I stop doing the smoothies, they start coming back. You could try the green pills when you travel, but they really can't compare to fresh greens - better than nothing though I'm sure! Mine were gross so I think I made them wrong. I use lettuce(which I've heard iceberg isn't the best), two apples, and frozen blueberries. It tasted quite gross. It tasted like apples and lettuce. That's why I'm just going to do a fruit smoothie. Stupid question, but: Will a centrifugal type of juicer work with this? I could only assume that the greens will just stay and dissolve in the lid. Two years with the moderate/severe acne crap, its time to do something about it!